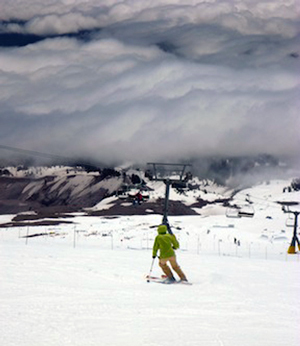 Lift tickets may be purchased at Timberline Lodge for $73/day. Bring your tested, working avalanche beacon, probe and shovel to the Friday and Monday ski trips. Pre check your climbing skins for sizing and adhesion. Please remember; Higher elevations require specific considerations, including unpredictable weather conditions and temperatures that vary considerably from morning to afternoon. Dress accordingly. camber metal edged skis are required. Safety straps or brakes are required. No shorts while skiing in clinic, please. Sunglasses and sunscreen are necessary. Altitude may cause physical difficulties; please prepare yourself physically for this clinic and be aware of your condition and limitations. Clinic elevation is 6,000 to 9,700 feet. Lodging is available at Mazama Lodge in Government Camp. This is bunk style lodging in a beautiful, rustic lodge. 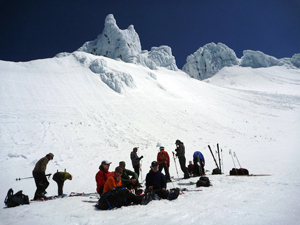 Please call Mazama Lodge directly to make lodging and food reservations. 503.272.9214.